Reviewer: M. Patton. 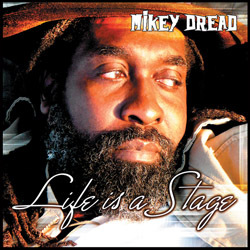 "General MP"
The next time you are out at your local reggae record shop, I want you to check out Mikey Dread’s new album"Life is a stage." When you hear the "Dread at Controls," the pioneering JBC DJ, on these new tracks you are a going to be in for a real roots reunion experience! The rekindling of musicians, bredren from long time, have regrouped decades later to produce Mikey’s greatest new works. The collaboration of master musicians like Sly Dunbar Flabba Holt, Dalton Browne, Bongo Herman, Deadly Headly, Style Scott, Santa Davis, Robbie Lynn, Tony Asher joined with Mikey’s uniquely original vocals have created a new classic. There are new songs like "Barcoding" and "Soundbwoy Special" that I have no doubt will impress Reggae listeners just as much as his eighties classics ran the sound systems across the world. Just sit back, roll up a fat spliff and listen to Mikey’s most distinguished sound in years. I can only say big up to all the singers and promoters of the wonderful sensimilla plant! In the song "Pound of Weed" Mikey asks the listener "have you ever smoked a pound a weed" and goes on like a true ganja connoisseur to name the various assorted strains of high grade marijuana. Mikey tackles some current world issues in songs like "Teenage Pregnancy", and "Stem Cells" bringing up some important things to consider. If you know Mikey, you know he is genuinely not at all content with the current runnins’ in the world today. So it is no surprise to hear him expressing his dissatisfaction with all the wickedness out there. He is not a man to hold back on his opinions. My favorite track, "Passing Through" pays homage to Africa. Mikey reasons, " the legacy of Africa is so great, but half of the story has never been told." I met some bredren from Senegal at a Mikey Dread show years ago, and let me tell you they love Mikey Dread ina Africa! His music is truly international and brings all kinds of people together from all nations, oneness. If you should have the good fortune of seeing this always professional, and ever talented roots Rastaman in concert you will be witnessing a true reggae pioneer. This is the man that bridged the gap between the U.K. punk scene with his early collaborations with the Clash. He also made vital contributions in his support to UB40 as well. Not to mention his early radio career which opened many doors for others to follow. Bless up the man known as Michael Campbell, a.k.a., Mikey Dread. Give praises to the Most High, gwaan with a pure heart, and a clean meditation and your works will continue to shine. Mikey Dread is on tour now in California. Check out his website at www.mikeydread.com for details.